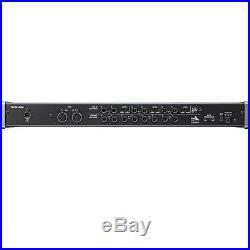 Tascam US-16X08 USB Audio Recording Interface / Mic Preamp 16-In 8-Out. The TASCAM US-16x08 captures 16 mic and line inputs to your computer with clear sound quality and advanced features to manage big sessions. Eight Ultra-HDDA microphone preamps deliver the cleanest and quietest operation in their class while delivering up to 56dB of gain. An additional eight line inputs are provided, two of them switchable to instrument level for direct guitar or bass recording. Eight balanced line outputs are also available, two with a level control on the front panel for monitoring. Built into the US-16x08 is a DSP Mixer for low-latency digital mixing. Each channel has four-band EQ and compression for polished-sounding monitor mixes. In addition to interface mode, the US-16x08 can be used stand alone as a standalone mic preamp. Mac and Windows drivers are provided, as well as USB Class Compliant 2.0 drivers for tablets like Apple's iPad. MIDI input and output are also available on the rear panel. Whether using the ergonomically-designed angled desktop stand or mounting with the included rack ears, the US-16x08 includes analog I/O for almost any music recording application. Ultra-HDDA Mic Preamps for Clear Audio Quality from All of Your Mics. TASCAM's own Ultra-HDDA mic preamps are the cleanest, quietest, and best-sounding from any interface in their range. A gain range of 56dB makes them ideal for any type of mic dynamic, condenser, or ribbon. With preamp performance well beyond any interfaces in their price range, the Ultra-HDDA preamps on the US-16x08 makes your tracks sound like a record. Discrete Ultra-HDDA Mic Preamps Deliver Low Noise and Low Distortion. TASCAM's Ultra-HDDA (High Definition Discrete Architecture) mic preamp design is based on discrete components, just like classic professional gear. Other impressive specs include a signal-to-noise ratio of 100 dB, out-speccing anything in its price range. But instead of judging the design merely by test measurments, key components were selected following extensive listening tests. Rock Out with Amp Simulator Software using the Guitar Inputs. The first two channels can be switched to direct guitar inputs. They're ideal for direct recording of electric and acoustic guitar and bass without the need for a preamp. Use them with amp modeling software, like the TH2 effect included with SONAR X3. Input specifications easily handle high SPL environments. The Ultra-HDDA mic preamps and line inputs offer 20dB of headroom for distortion-free recordings of percussive, high SPL instruments like drum tracks. 16 analog inputs to record a full drumset, instruments, and vocals at the same time. Eight XLR mic inputs and eight TRS inputs can be used simultaneously for 16-track live recordings. Capture every detail of live performances or rehearsals for later mixdown. Eight XLR mic inputs and 8 TRS line inputs. The eight XLR mic inputs have switchable +48V phantom power to use up to 8 condenser mics at the same time. The two front panel TRS line inputs are switchable between instrument level and line level input with adjustable gain. An additional six TRS line ins on the rear of the unit are switchable between -10dB and +4dB. All of the jacks support balanced or unbalanced 1/4 signals. Use as a Standalone Mic Preamp. When powered on with out a USB connection, the US-16x08 functions as an 8-channel microphone preamp. Mics pass through the Ultra-HDDA preamps to the eight balanced line outputs on the rear panel. Use the interface to add additional high-quality mic inputs to a mixer an another audio interface. When using the mic preamp mode, each input is connected to each output directly. Also, cannot use all functions of DSP mixer. For example, IN1 is connected OUTPUT1 directly through the Ultra-HDDA mic preamp. Advanced Digital Processing Includes an Advanced DSP Mixer and All-New USB Driver. Digital processing features like the DSP Monitor Mixer and advanced USB drivers make sessions with the US-16x08 comfortable for the musicians and engineer. The DSP Mixer includes processing for a polished-sounding headphone mix without latency delay from your DAW software, fueled by a Blackfin DSP processor. And new drivers, re-written from the ground up, provide beter compatibility and performance on Mac, Windows and iPad recording systems. High Resolution Recording Up to 96kHz/24-bit. The converters and electronics on the US-16x08 allow you to record at audio resolutions up to 96kHz/24-bit for detailed acoustic productions. No matter what your session's sample rate is set for, the high-quality analog and digital design make your recordings sound their best. Standard USB 2.0 Computer Connection. The US-16x08 uses USB 2.0 to connect to your computer, found on nearly every computer manufactured in the last 10 years. Simply connect the interface to any available USB port. USB 2.0 provides plenty of data bandwidth, even when recording 16 channels at 96kHz/24-bit. The US-16x08 will also work with USB 3.0 jacks on your computer. Advanced DSP Mixer Features 4-band EQ and Compression On Each Channel. Powered by an Analog Devices BlackFin DSP processor, the US-16x08 includes an advanced digital mixer for monitor mixing. Each input includes 4-band EQ, a low-cut filer, and compressor. The DSP mixer can store up to 10 snapshots as scenes - making it easy to recall mixer settings. An additional tab opens a digital patchbay to route signals to any output. All-new advanced USB Driver Software. The US-16x08 includes an all-new driver architecture, written in-house by TASCAM engineers. The Windows driver software can be installed without connecting the interface, with simple on-screen instructions. Mac users can use the interface without installing a driver at all. Simply install the control panel software in order to change device settings. Finally, the class-compliant driver allows it to be used with tablets like Apple's iPad. (Requires Apple's Camera Connection Kit for USB connection). Sleek Industrial Design Inspires Creativity. These powerful new interfaces are housed in modern industrial designs that are as ergonomic as they are stylish. TASCAM was the first company to offer a USB audio interface, and we have fused our years of experience with acclaimed German from designbox. TASCAM's new US series satisfies the needs of musicians from an aesthetic as well as ergonomic perspective. With its unique honeycomb structure on the side panels, the main body has a sense of weight while also maintaining a delicacy that matches the user's needs. Honeycomb structures are a feature of modern architecture, but are also a vital resource whose exceptional technical structure we can use in design. As this structure is found in nature, it has a stability and flexibility which comes with being an organic form. A German audio design company founded by Axel Hartmann and Stephan Leitl in 1995, designbox has worked on famous music industry products such as synthesizers, effect pedals and amp simulators. Angled design provides excellent usability on a desktop. The angled design makes desktop viewing and operation much more comfortable for tabletop use. All other interfaces have their controls on the front or the top of the device, causing you to crane your neck to read the knobs and switches. The US-16x08 are at a natural angle, making operation easier to keep you creative. A pair of rack ears are also included for use in a standard 19 equipment rack. Built to tough robust full metal body. The durable metal jacket is employed for heavy duty use. Separate Volume Controls for Headphones and Line Output. The US-16x08 includes both headphone and line output volume controls. Even when both powered monitors and headphones are connected, the user can set an optimum level for each during operation. And when you want to work on headphones, you don't need to reach around to switch off your monitors. Powerful Headphone Amp Provides 70mW per Channel. The high-output 70mW+70mW (into 32) headphone amp makes headphone monitoring easy even in loud situations. This assures you enough monitoring volume when recording drums, guitars, or rehearsals, live or in the studio. Class-Compliant Drivers for use with iPad and Other Tablets. The US-16x08 is built with class-compliant drivers built into the units. Not only does this mean that they can be used with many computers without first installing a driver, they also open the possibilities of with tablets such as Apple's iPad. Connect to iPad, iPhone, or other iOS devices. Use Apple's Camera Connection Kit to connect the US-16x08 to an iPad or other iOS device. Utilitze the multichannel audio and MIDI functions with any of the thousands of iOS audio apps, like Garage Band or TASCAM's Portastudio app. Apple's Camera Connection Kit is not included with this product. When connected, the US-16x08 will not provide power to the iOS device. Tested with Sonar, Pro Tools, Cubase, Live, Studio One, and Garage Band. TASCAM has tested the interface operation with all leading DAW software, such as SONAR, Pro Tools, Cubase, Live, Studio One and Garage Band. Use the interfaces with your favorite Mac or Windows recording applications. MIDI Input and Output Included. Standard MIDI input and output connectors allow connection with the thousands of keyboards, drum machines, controllers, and other sources that employ MIDI connectors. The interfaces can also be used for synchronized operation of multitrack recorders and other external recording equipment. Ultra-HDDA (High Definition Discrete Architecture) mic preamps with 125dBu EIN. Eight Ultra-HDDA mic pres with XLR connectors, eight TRS inputs. Standalone mode for use as an independent mic preamp. Support for Windows and Macintosh. USB 2.0 computer connection. Connect with iPads and other iOS devices via Class Compliant drivers. +48V phantom power available for all microphone inputs. 56 dB of preamp gain, ideal for dynamic or ribbon microphones. Tough metal casing for durability. Standard TRS headphones output jack with 70mW/ch output power. Separate controls for line and headphones output volumes. Low-latency monitoring via on-board DSP mixer. DSP mixer with 4-band EQ and compression on each input channel. Digital Patch bay allows outputs to be assigned freely. Scenes can store DSP mixer settings (up to 10 scenes can be stored and named). USB class compliant 2.0 support. Confirmed operation with major DAW software (SONAR, ProTools, Cubase, Live, Studio One, Garage Band). 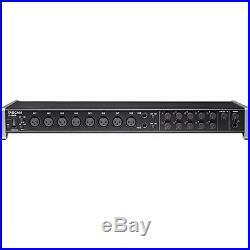 The item "Tascam US-16X08 USB Audio Recording Interface / Mic Preamp 16-In 8-Out" is in sale since Tuesday, February 10, 2015. This item is in the category "Musical Instruments & Gear\Pro Audio Equipment\Audio/MIDI Interfaces". The seller is "*pitbullaudio*" and is located in National City, California. This item can be shipped worldwide.